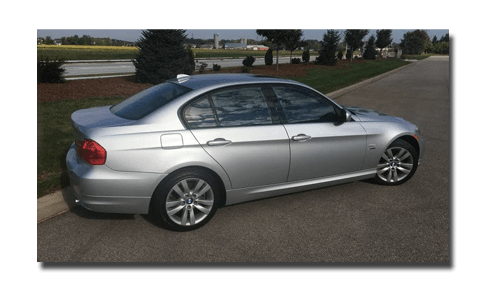 If your twin turbo N54/N55 engine is hard to start, is experiencing cylinder misfires, idling rough, and(or) is in “limp mode”, you most likely need a BMW high pressure fuel pump (HPFP) replacement. 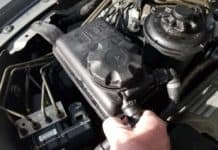 A BMW high pressure fuel pump replacement is a fairly straightforward repair with one caveat: the intake manifold must also be removed from the engine in order to access the fuel pump mounting bolts. 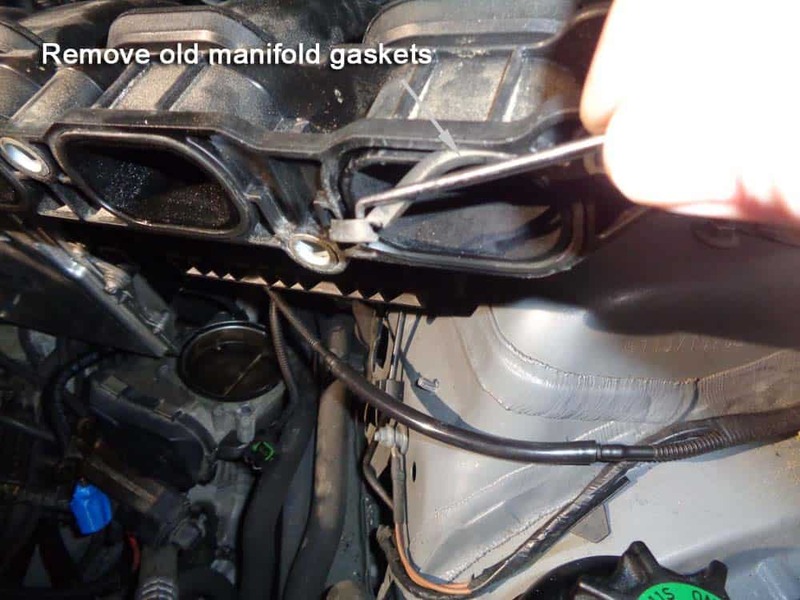 Since the intake manifold must be removed, you should also replace your intake gaskets which are also prone to failure if reused. 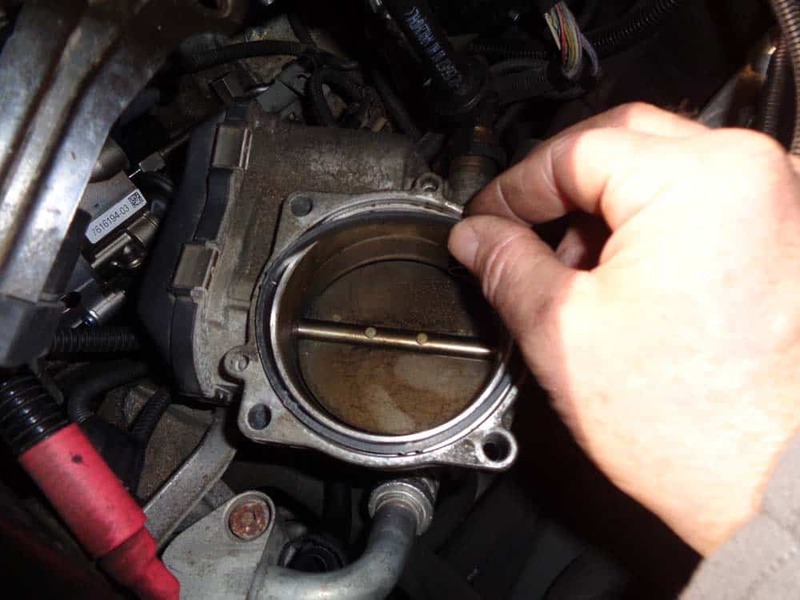 You should also replace the o-ring on your throttle body since it must be removed as well. 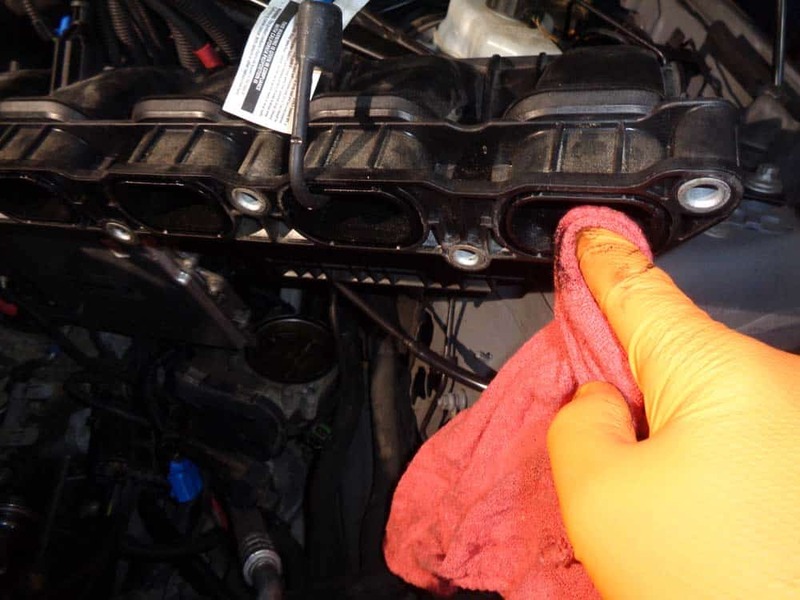 Like the intake manifold gaskets, it is prone to leaking if reused. 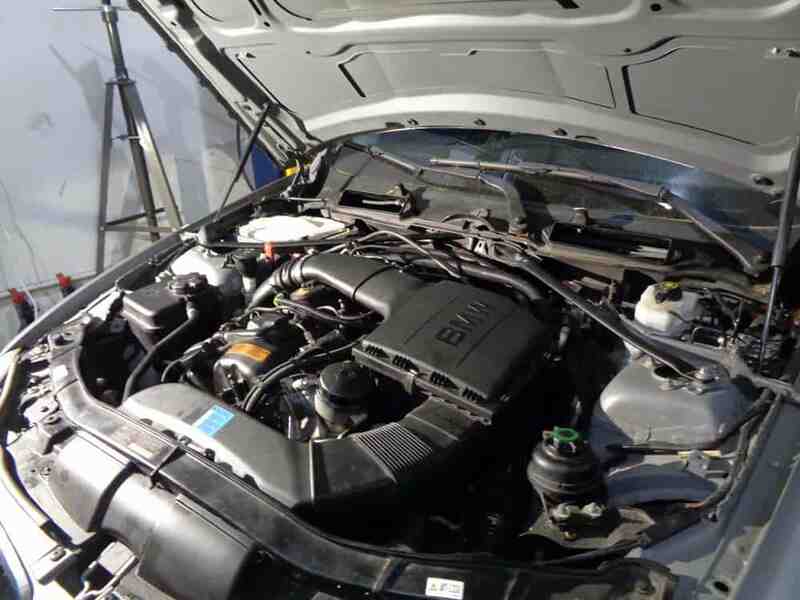 2011 335I with the N55 turbo inline 6 engine. 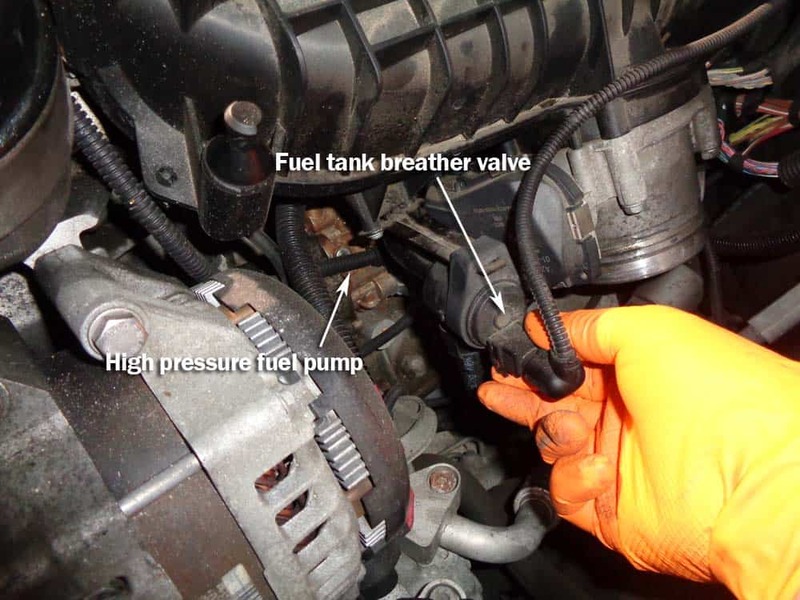 Causes for a BMW high pressure fuel pump failure are not always straightforward, although recent investigation has pointed towards poor engine oil service intervals or use of the incorrect engine oil (not BMW certified) as the likely culprits (see our article on choosing the correct engine oil for your vehicle). 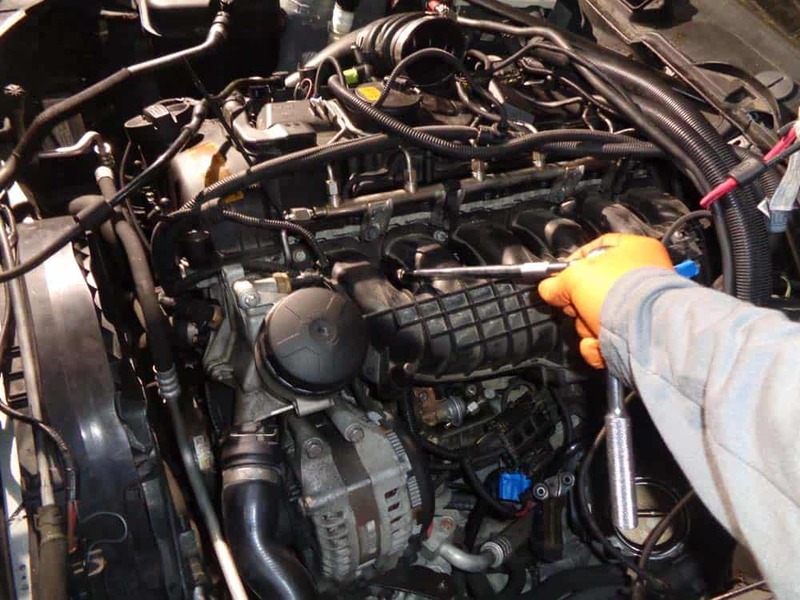 Since the pump is driven by the engine camshaft, improper lubrication can wreak havoc on its internal parts. Other causes for failure are fuel leakage and solenoid issues. 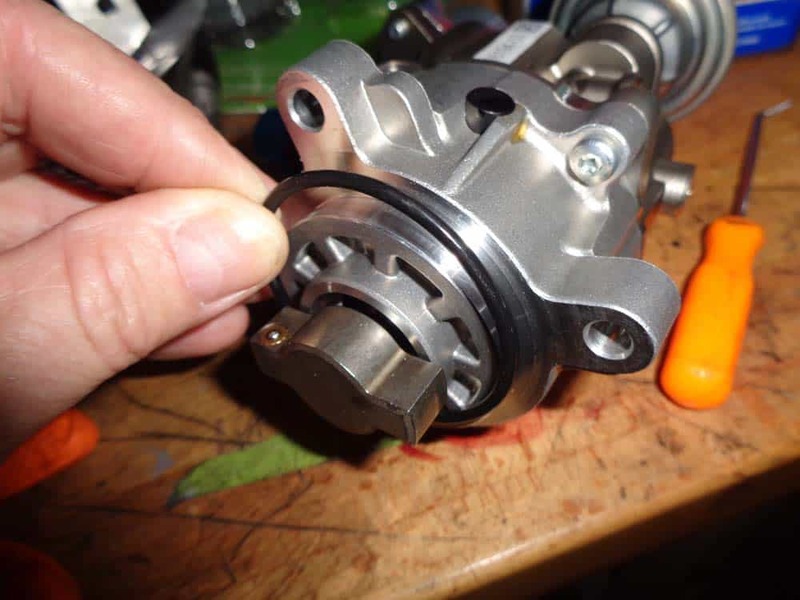 ***Avoid purchasing “cheap” generic branded fuel pumps on sites like Amazon or Ebay. THESE PUMPS WILL FAIL. 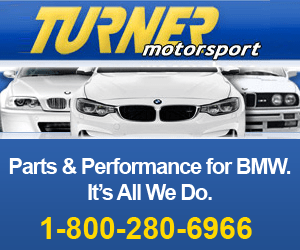 The BMW Repair Guide strongly recommends you only purchase a genuine BMW pump. 5mm long reach hex socket. ***You must have this tool. 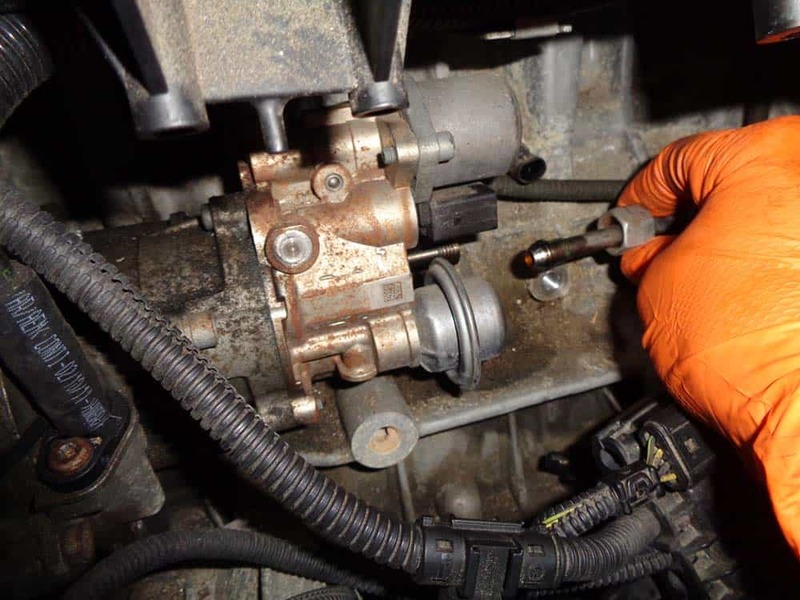 You cannot remove the fuel pump bolts unless you have a “long reach” hex socket. 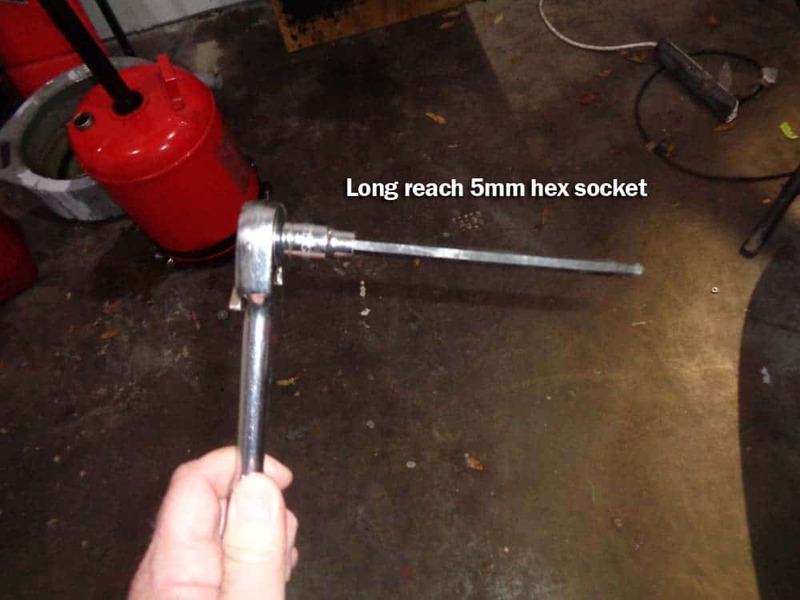 A regular hex wrench or small socket WILL NOT WORK! 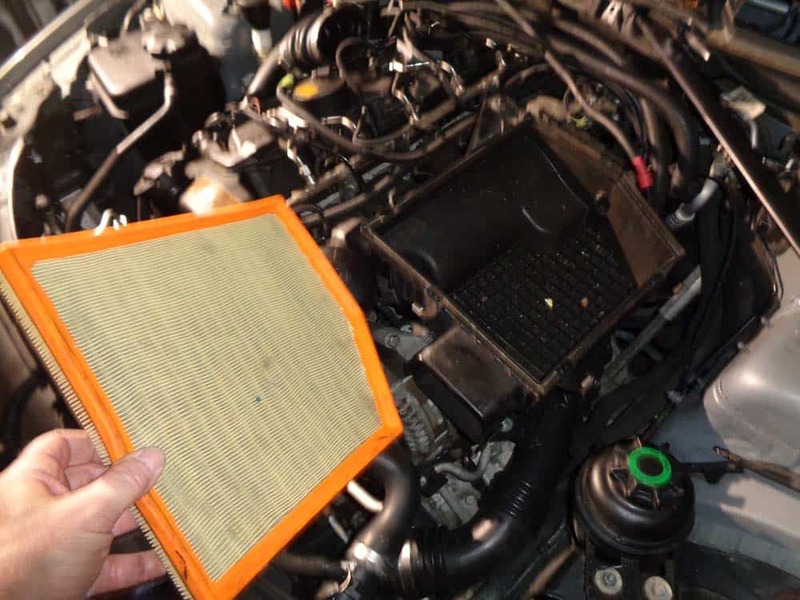 *** The following shows the steps for removing the cowl cabin filter housing from a BMW E90 335i. 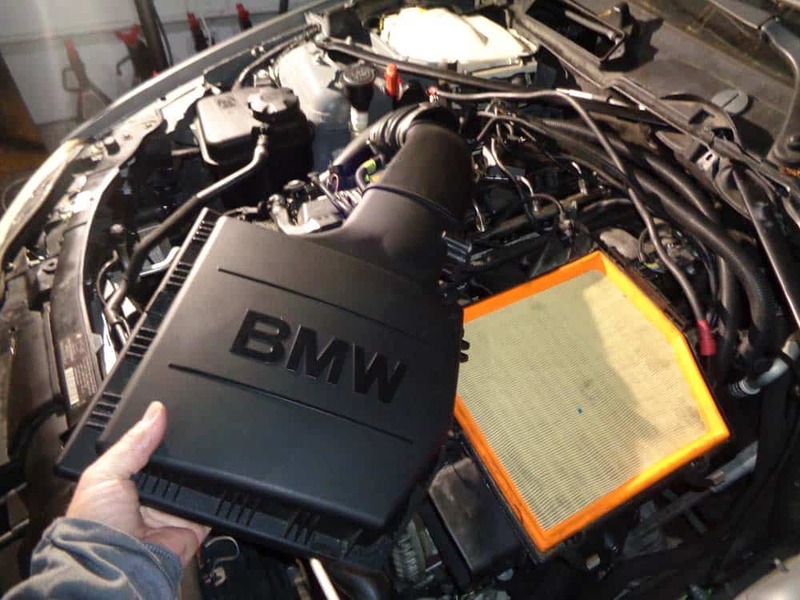 Please be aware that the steps for removing the cowl filter housing from other BMW models will be different. Remove the five 8mm screws anchoring the upper filter housing. 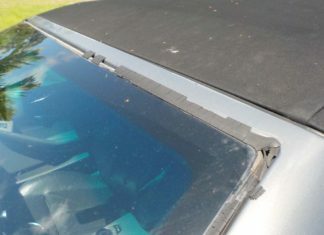 Remove upper filter housing from vehicle. 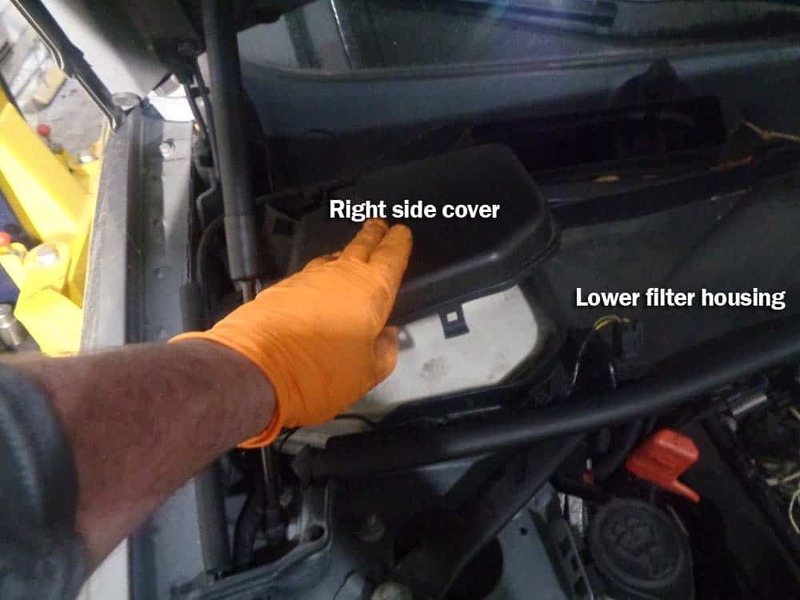 Unsnap and remove the two side covers (both left and right) from the lower filter housing and remove from vehicle. 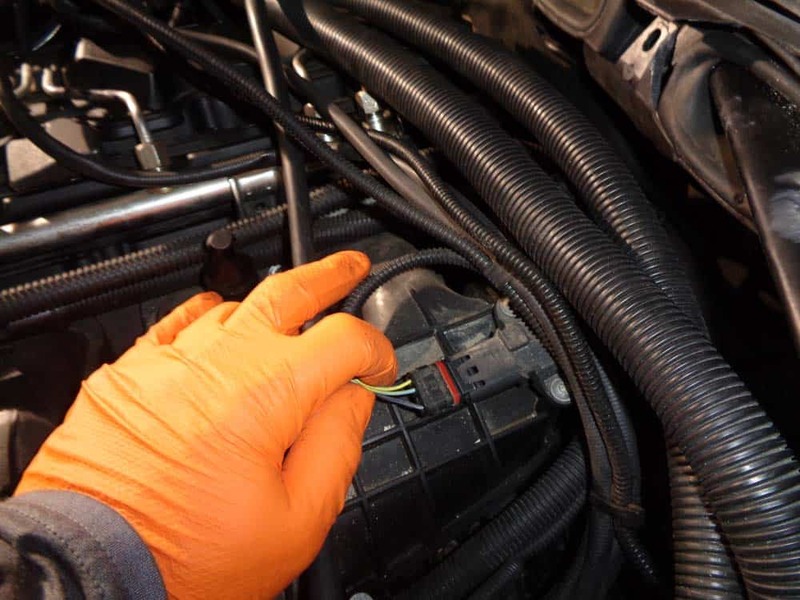 Remove the right and left electrical connections from the lower filter housing. 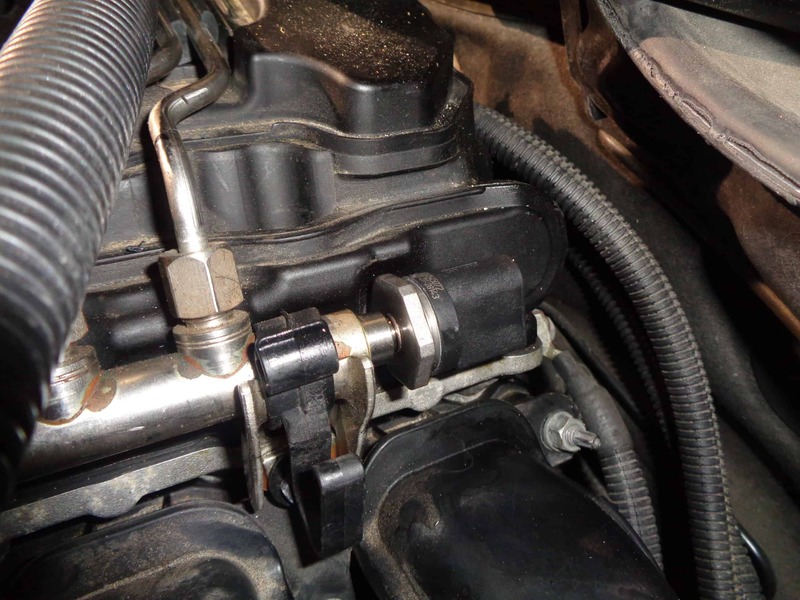 Use an 8mm nut driver to remove the two screws anchoring the lower filter housing to the vehicle. 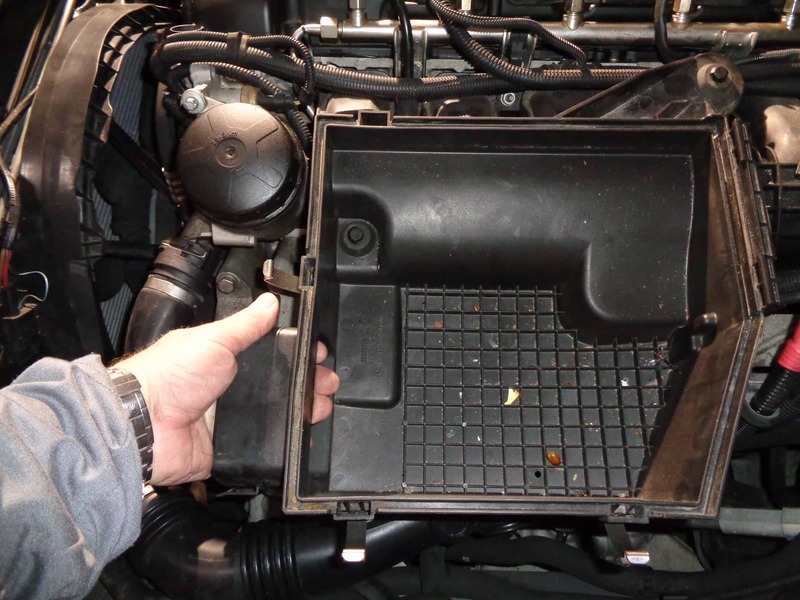 There is a screw on both the right (passenger) and left (drivers) side of the lower filter housing. 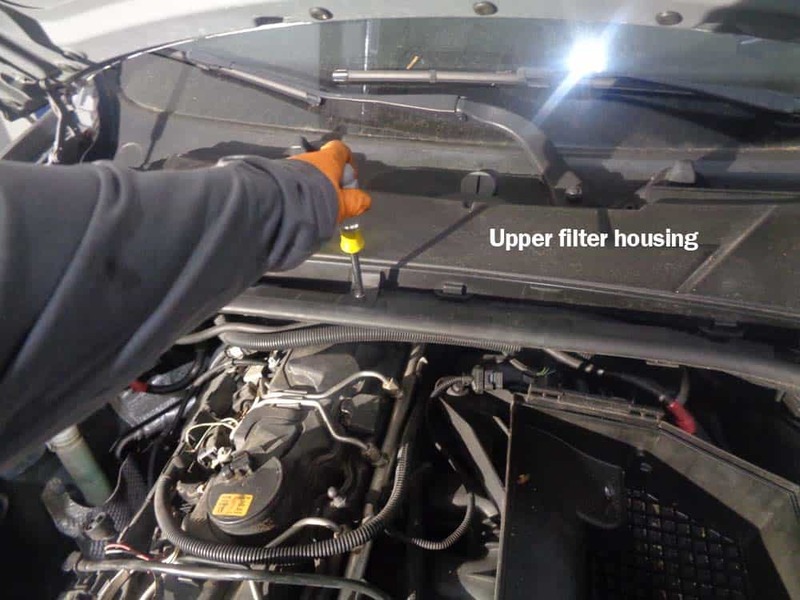 Remove the lower filter housing from the vehicle. 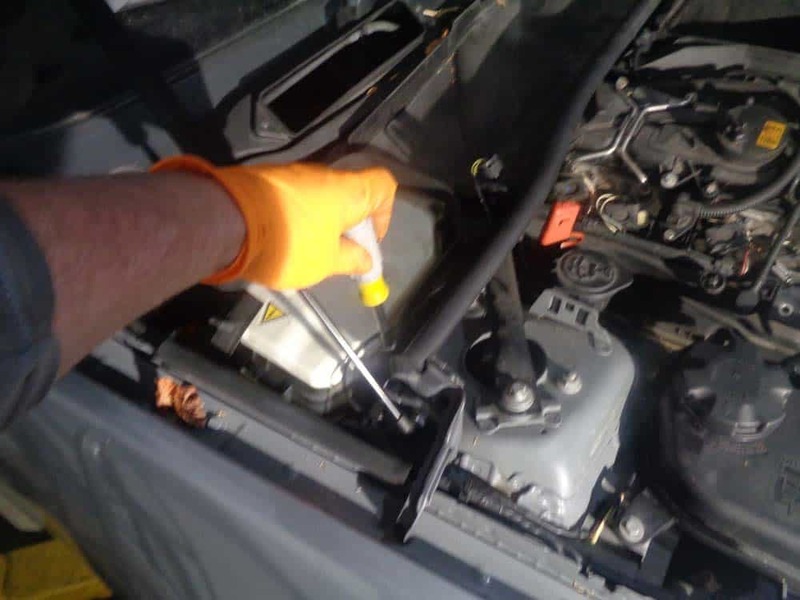 Use a T20 torx bit (or phillips head screwdriver) to remove the two screws anchoring the intake duct to the front of vehicle. 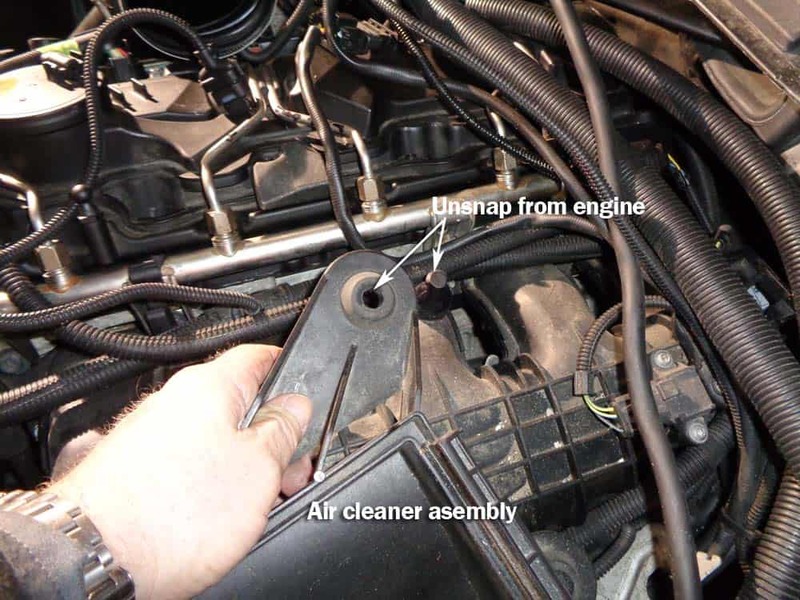 Unsnap the intake duct from the air cleaner assembly and remove from the vehicle. 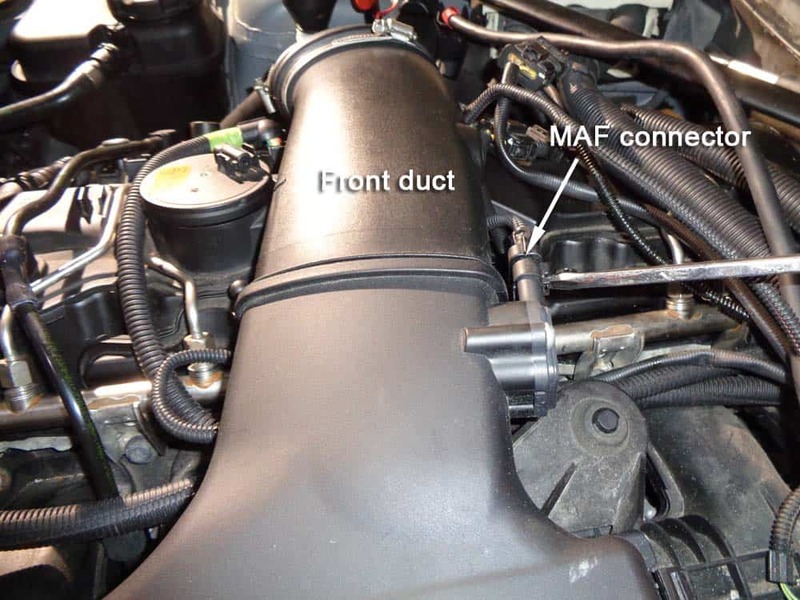 Use a flat blade screwdriver to remove the Mass Air Flow (MAF) electrical connector from the front duct. 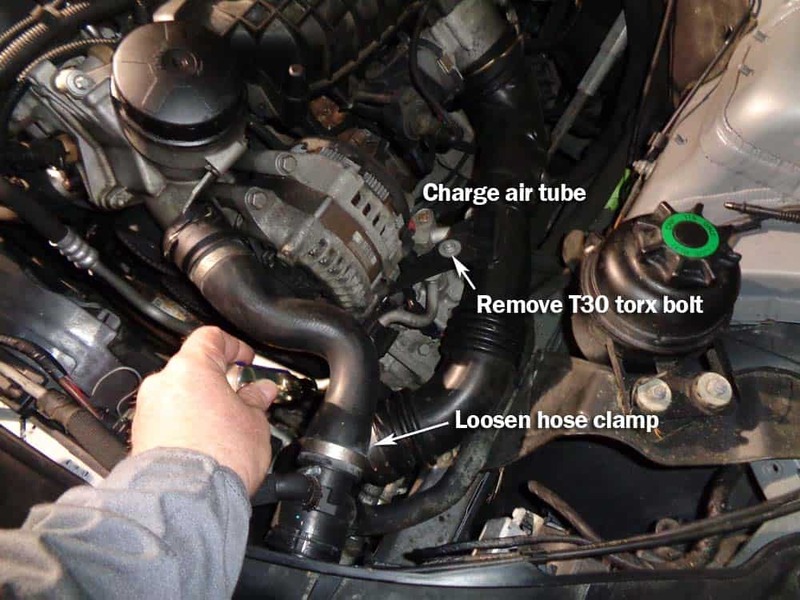 Loosen hose clamp connecting air cleaner assembly to front duct. 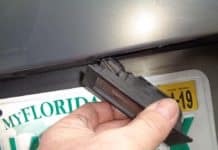 Unclip the lid of the air cleaner assembly and remove. 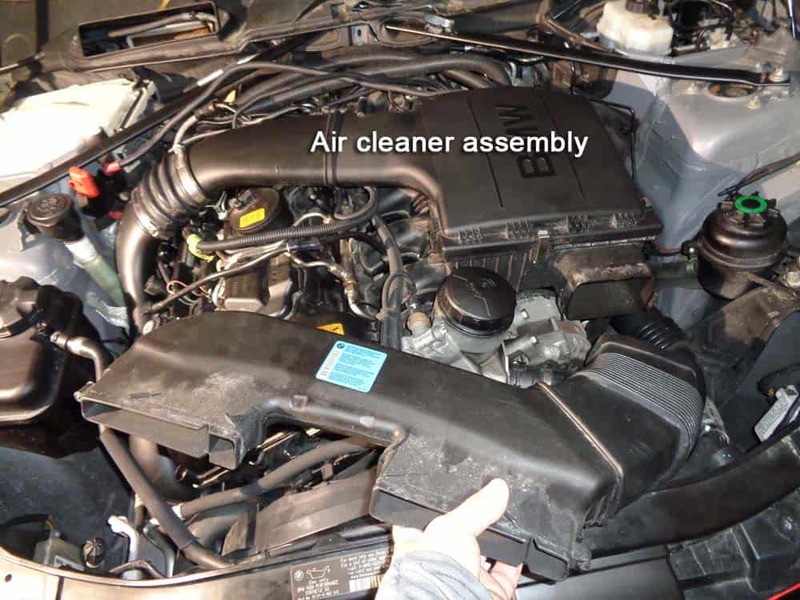 Remove air filter. 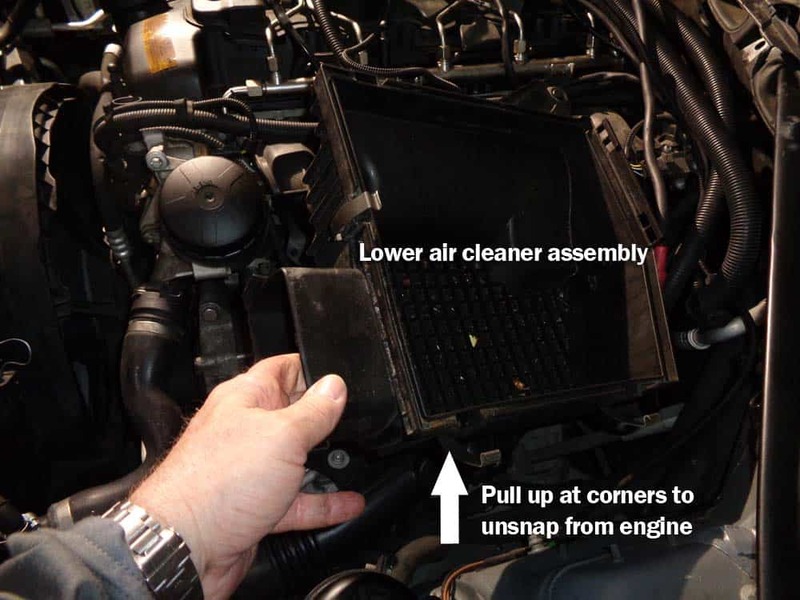 The lower air cleaner assembly simply unsnaps from the engine. Remove from engine bay. Unsnap the locking ring that connects the turbo charge air tube to the throttle body with flat blade screwdriver. 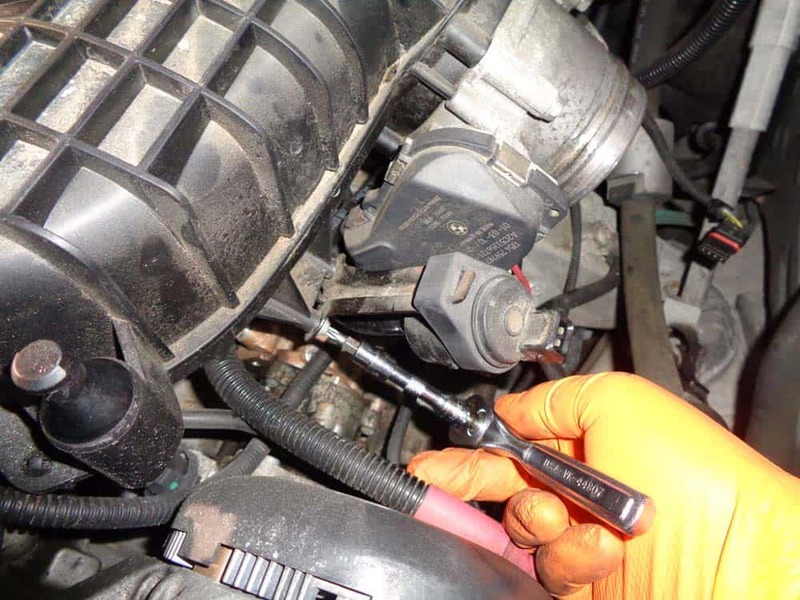 Loosen hose clamp and remove T30 torx bolt anchoring tube to engine. 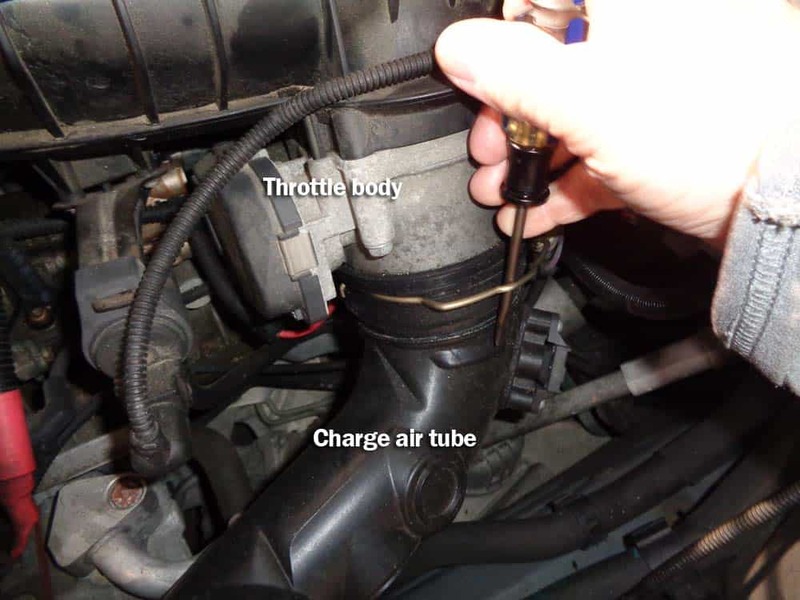 Remove the air charge tube from throttle body (a flat blade screwdriver helps remove a “stuck” air tube from throttle body-see below). 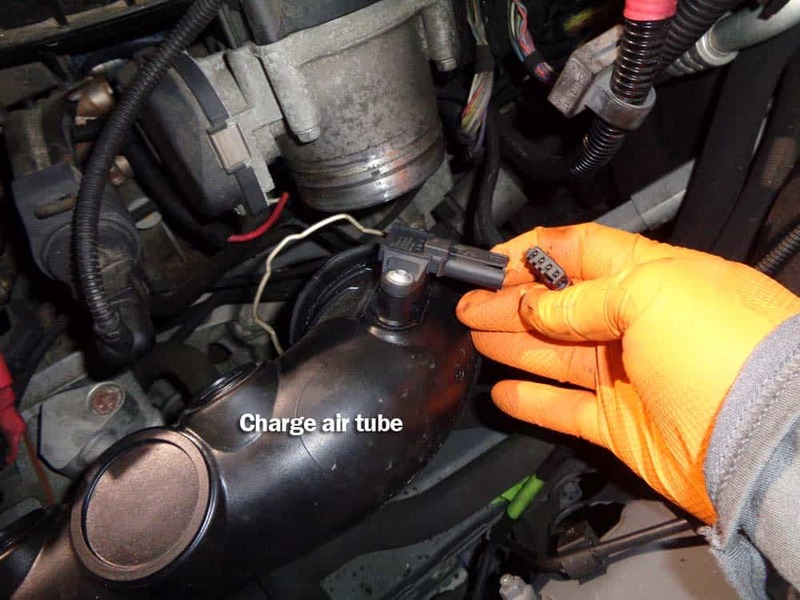 Remove electrical connector from charge air tube and remove tube from engine compartment. 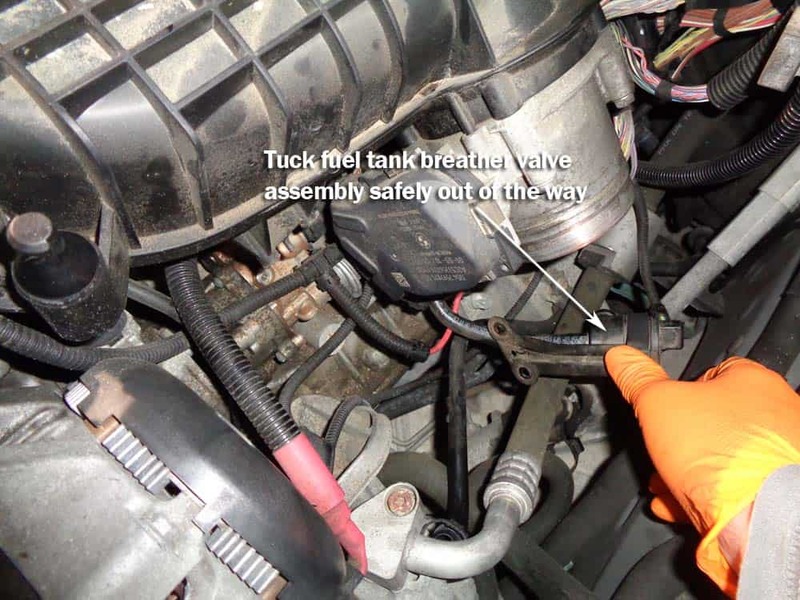 Remove the electrical connection from the fuel tank breather valve. 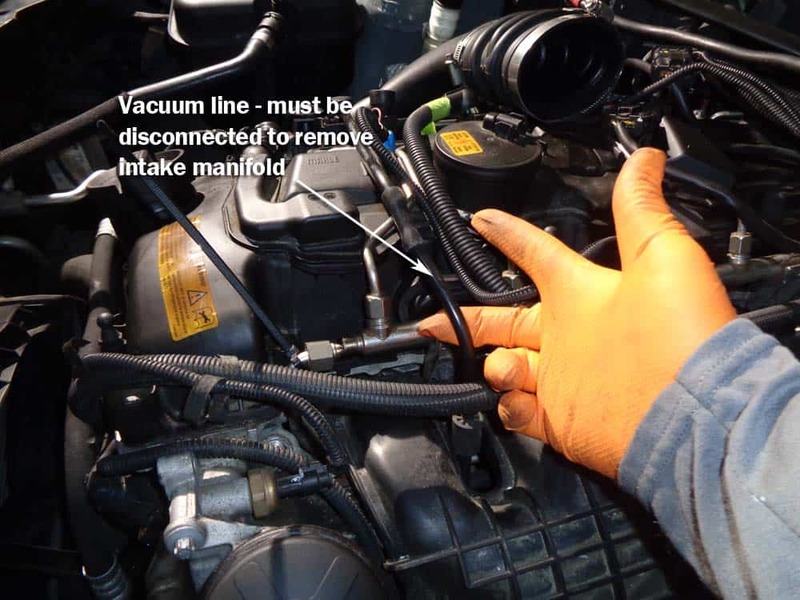 Remove the plastic vacuum hose from the bottom of the valve by squeezing the plastic ring and pulling off. Finally remove the two T25 screws anchoring the valve bracket to the engine and tuck away safely. 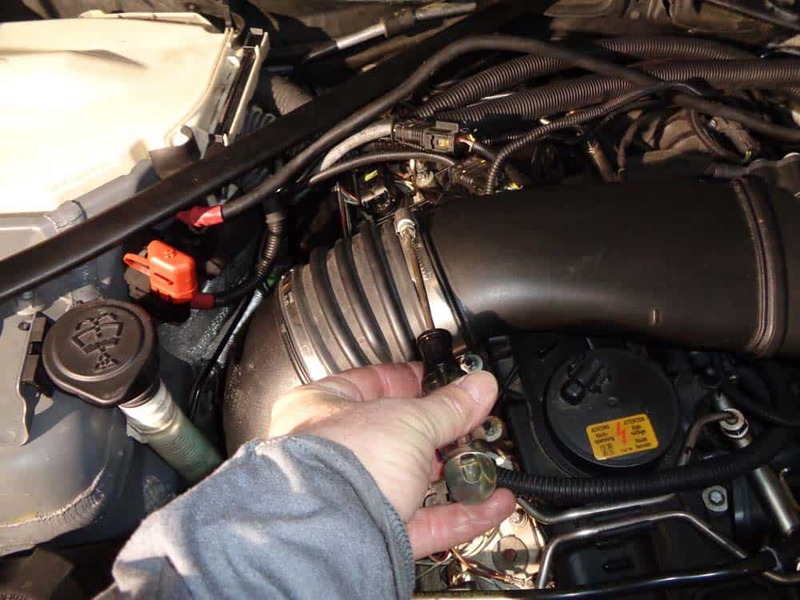 Remove the four 10mm throttle body bolts and pull loose from intake manifold. Push to side out of the way. Grab the wiring harness and pull out and off of mounting bracket. Push out of the way. 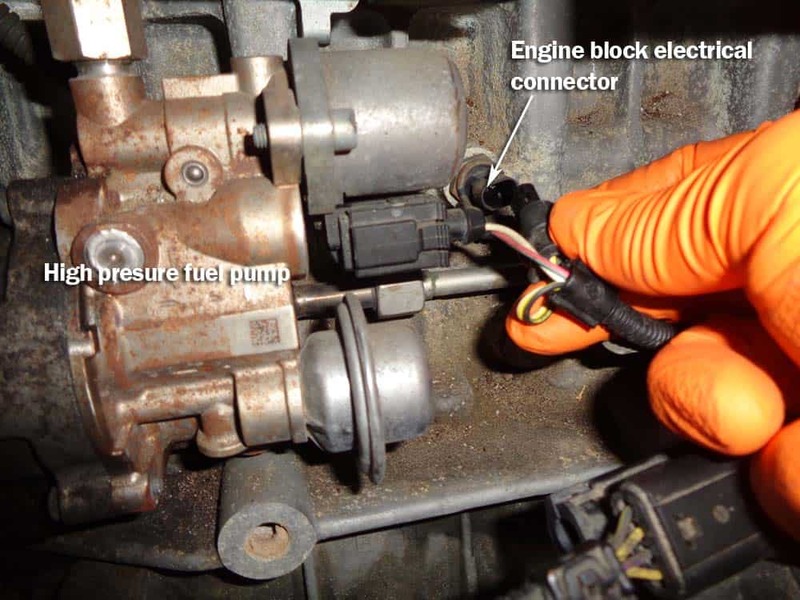 Disconnect engine block electrical connector behind fuel pump. 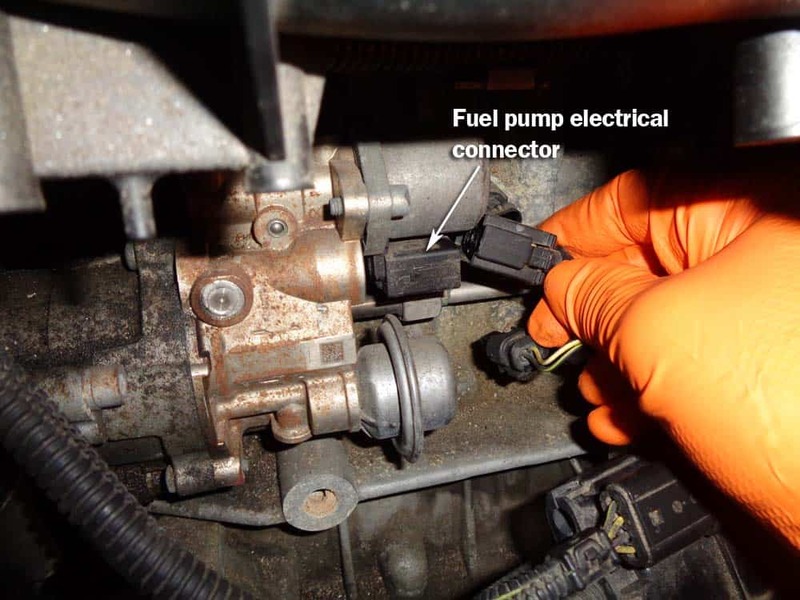 Disconnect electrical connector from back of fuel pump. 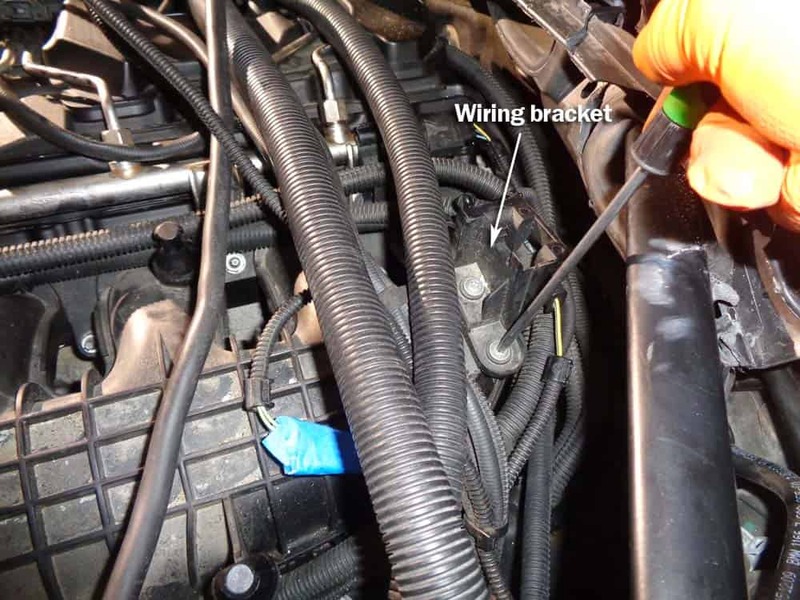 Remove the electrical connection from the sensor located on rear of intake manifold (see images below). 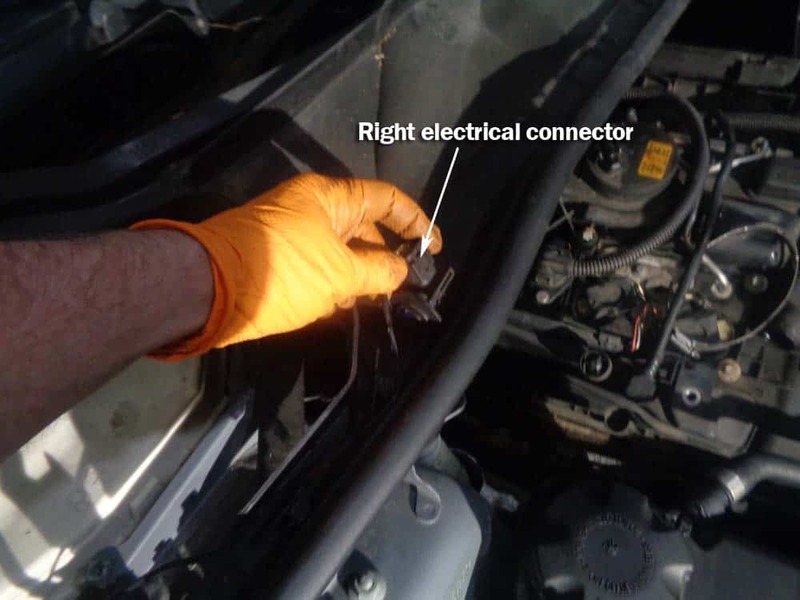 A metal pick helps in releasing the connection. 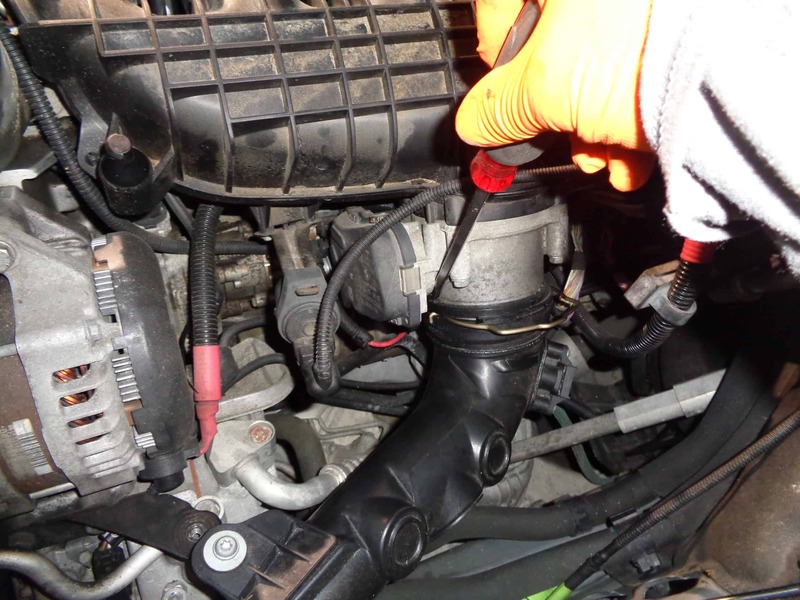 Use a T25 torx t-handle to remove the wiring bracket from the rear of manifold. 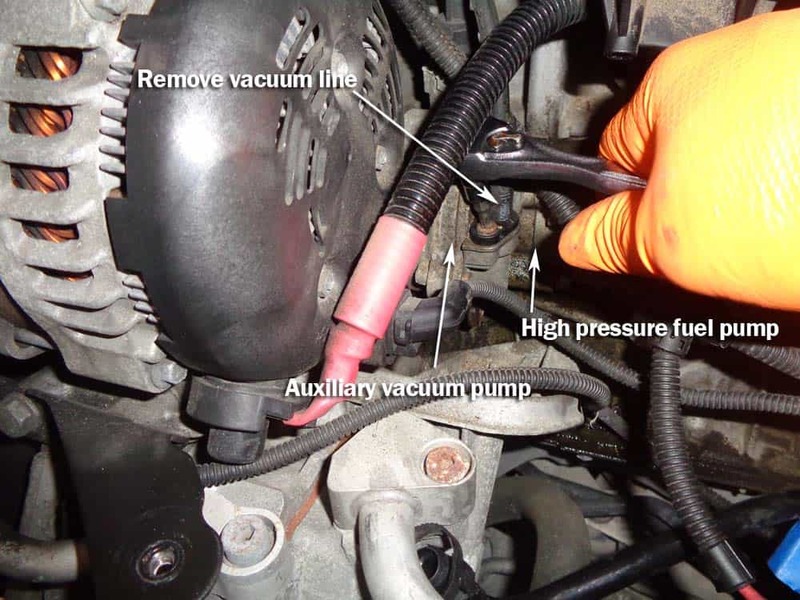 The vacuum line that runs from the cylinder head cover to the auxiliary vacuum pump must be removed. 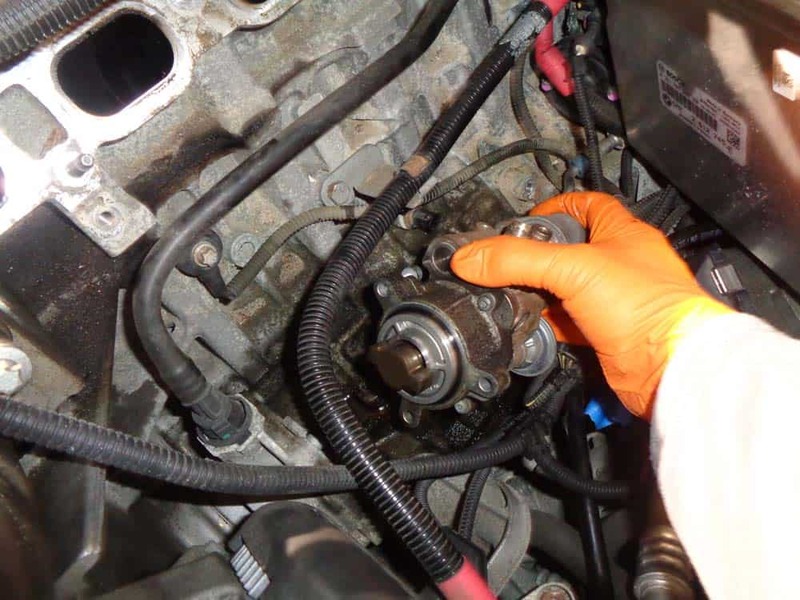 Use a T25 socket to remove the bolt securing it to the pump housing and then pull out and clear of intake manifold. 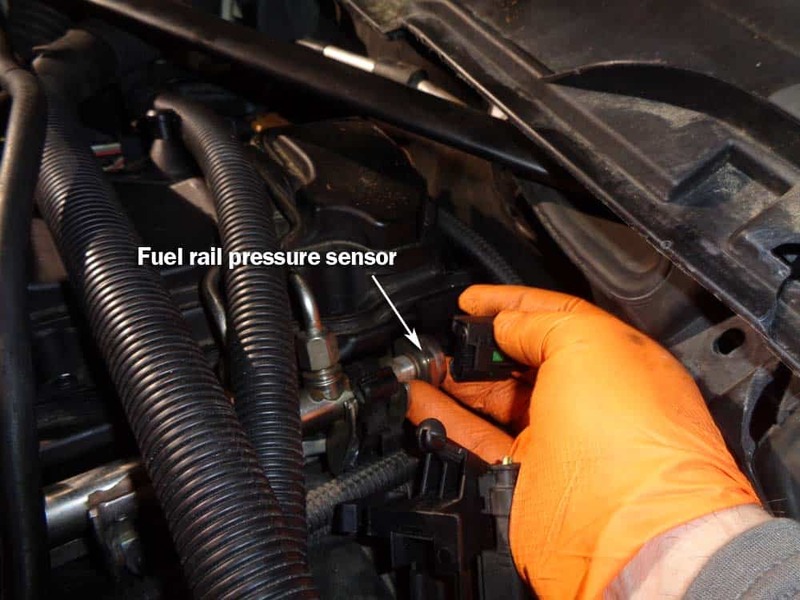 Disconnect electrical connection from fuel rail pressure sensor. 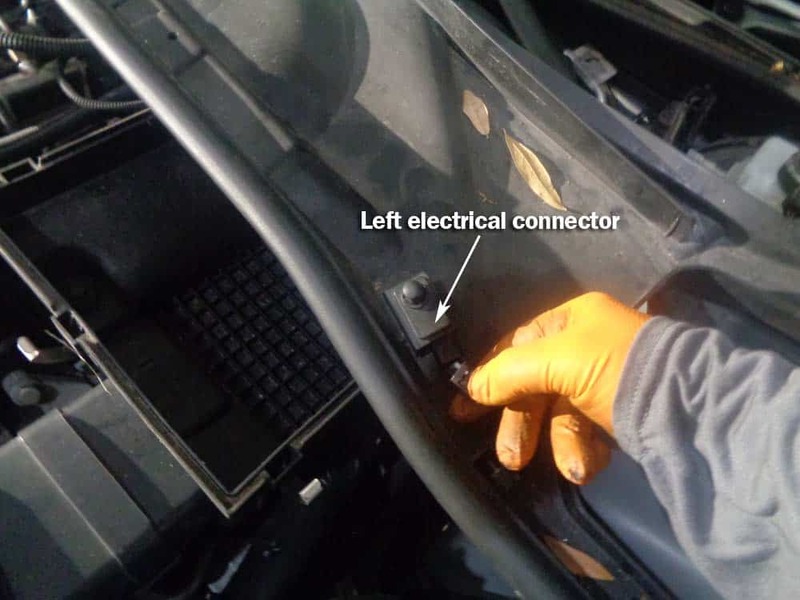 The pressure sensor is located at end of fuel rail near firewall of vehicle. 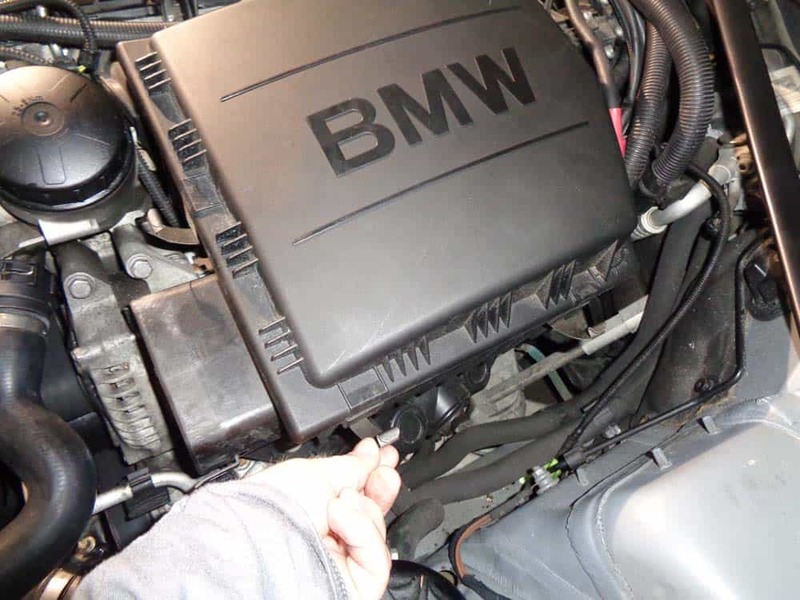 ***The BMW Repair Guide recommends also replacing your pressure sensor when doing a BMW high pressure fuel pump replacement. 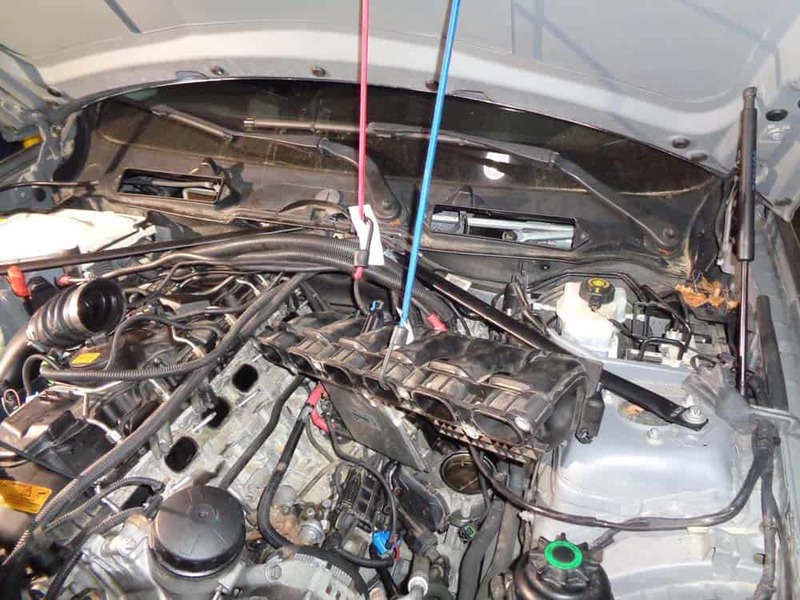 Gather up all of the loose wiring on top of intake manifold and neatly bungee cord out of the way. 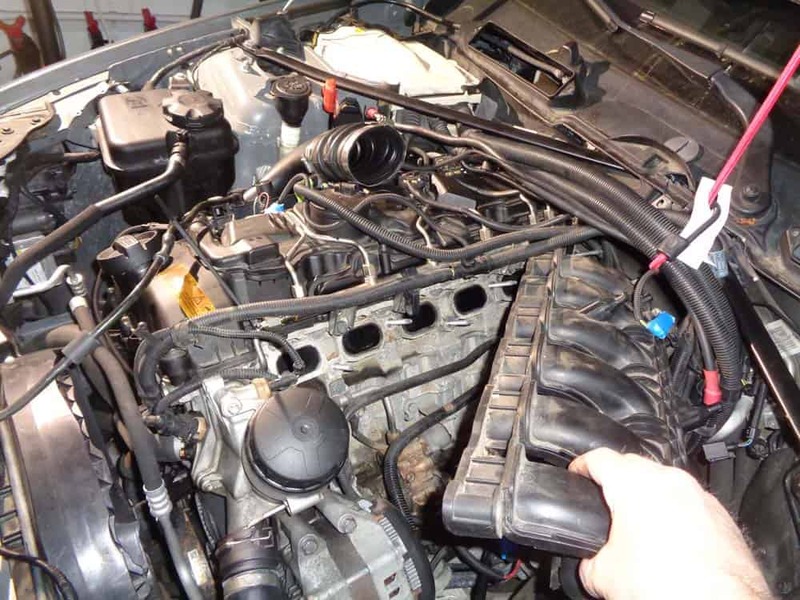 Remove the seven 11mm nuts anchoring the intake manifold to the engine block. 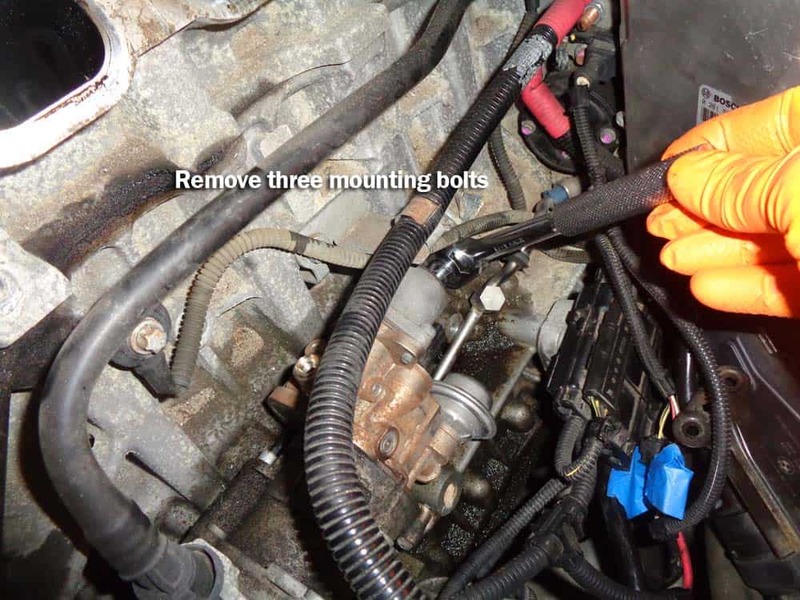 Remove intake manifold and bungee cord out of the way. 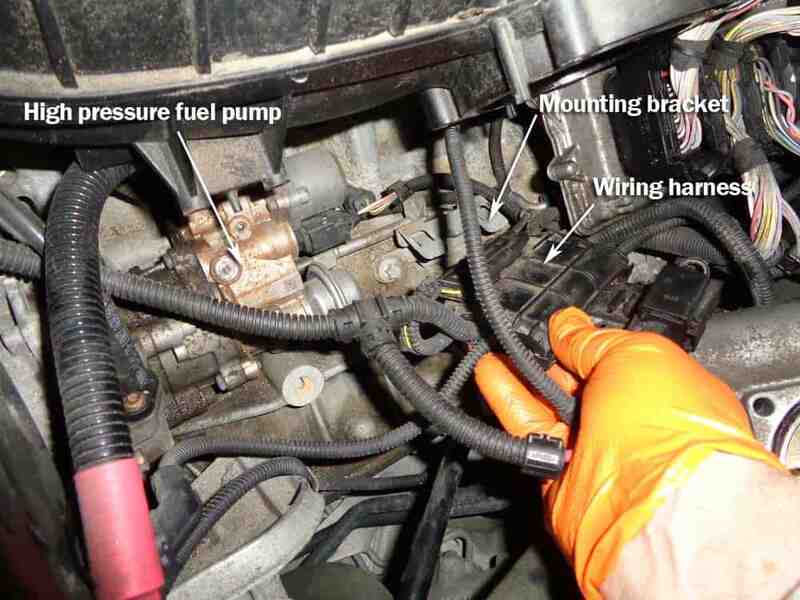 ***Note – avoid removing the wiring harnesses on bottom of intake manifold if possible. 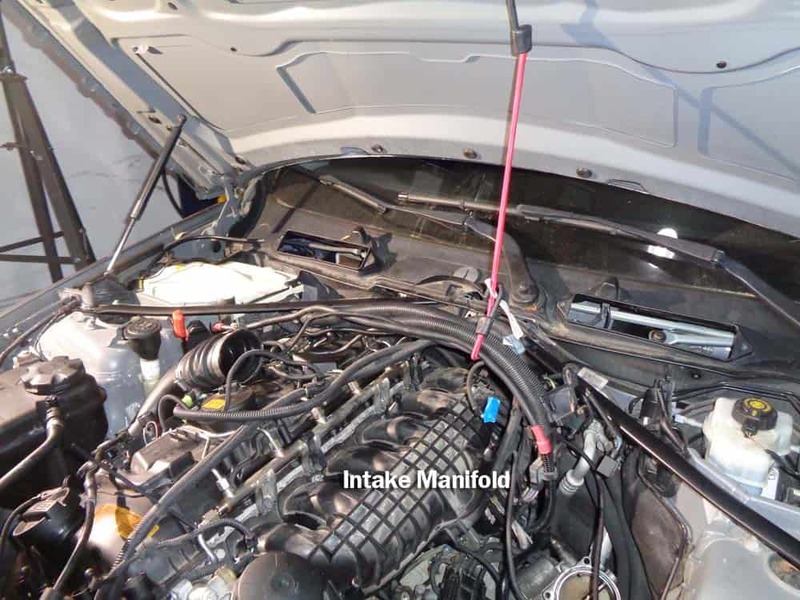 You should be able to remove intake manifold and bungee cord to hood without removing them. 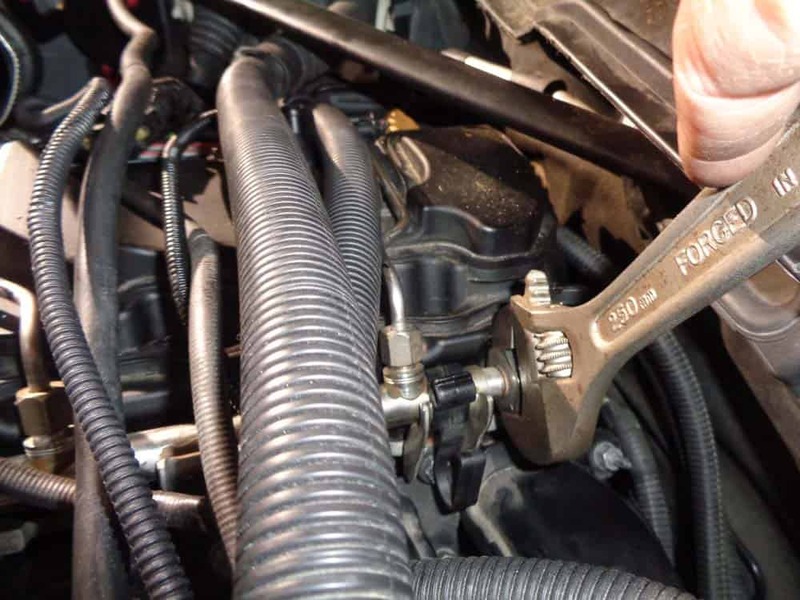 Using a 17mm open end wrench, loosen the nut attaching the rear fuel line to pump. 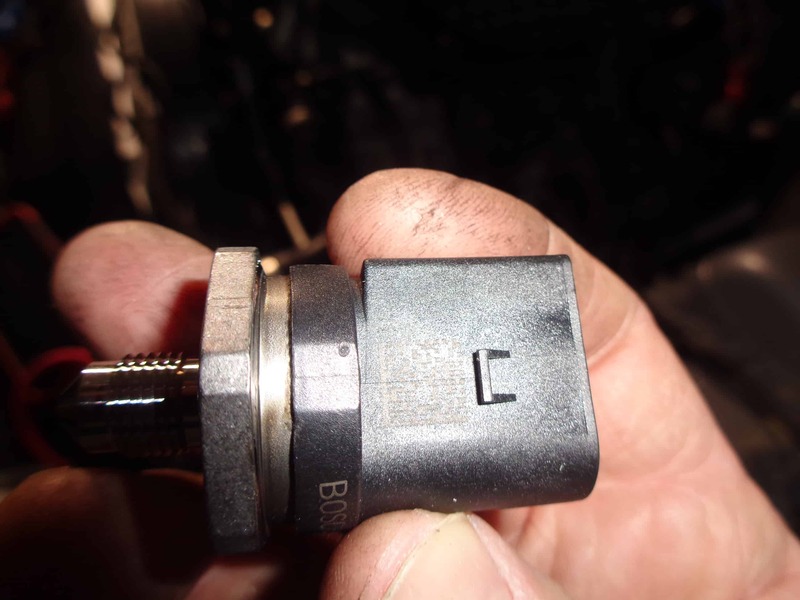 Remove the 2 wiring harness bracket bolts using an E10 torx socket. 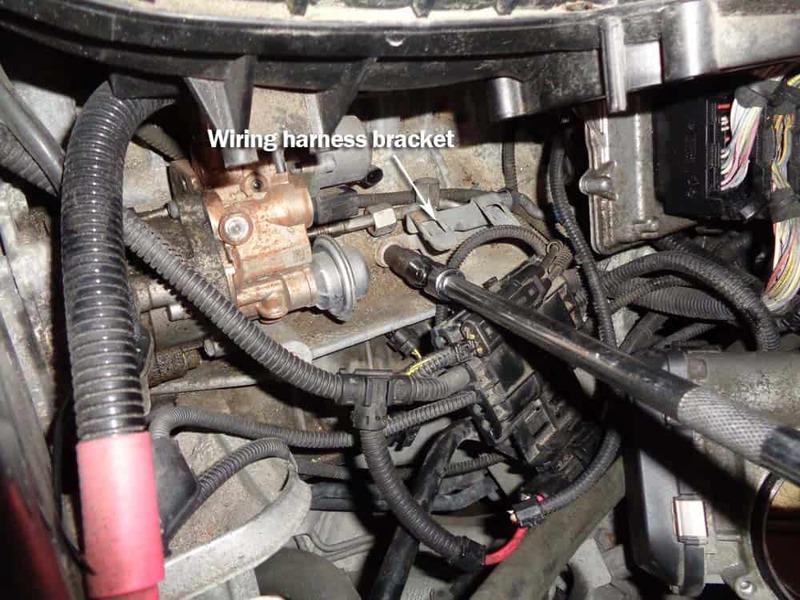 The wiring harness bracket also serves as the rear fuel line anchor to the engine block. Pull rear fuel line loose from pump and tuck away safely. 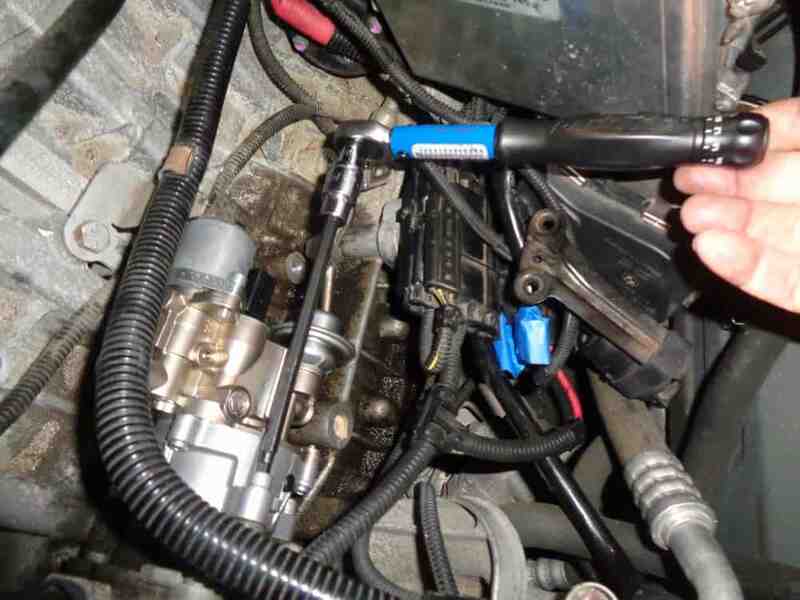 Using a 17mm open end wrench, loosen the nut attaching the top fuel line to the pump. 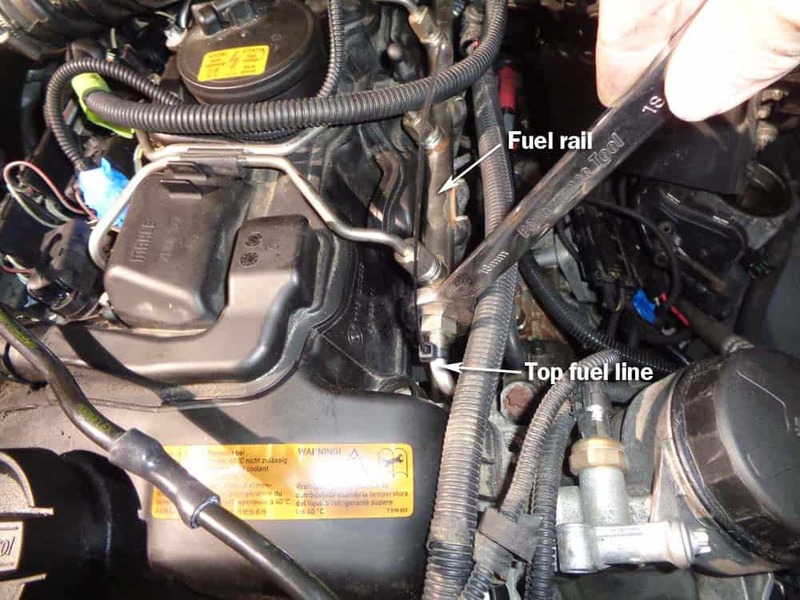 Use a 17mm wrench to disconnect the top fuel line from fuel rail. 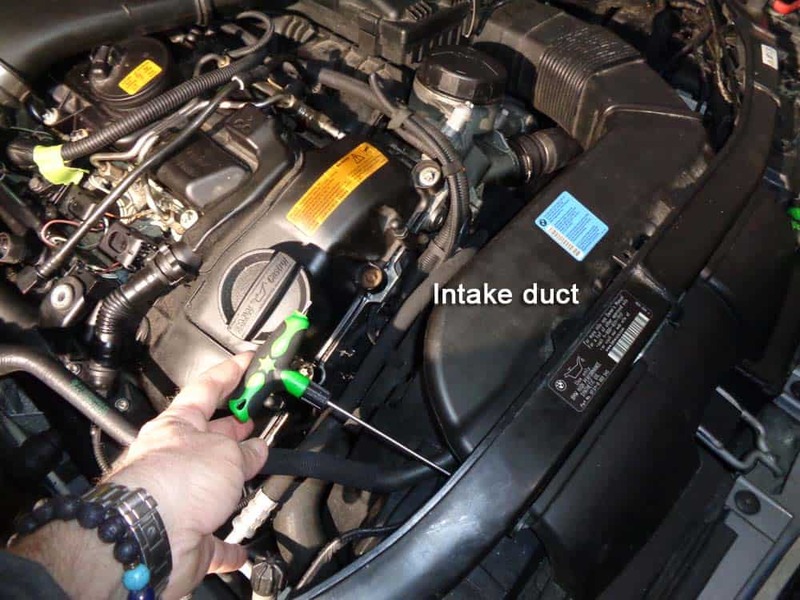 Use a 10mm socket to remove the bolt anchoring the top fuel line to the engine block. 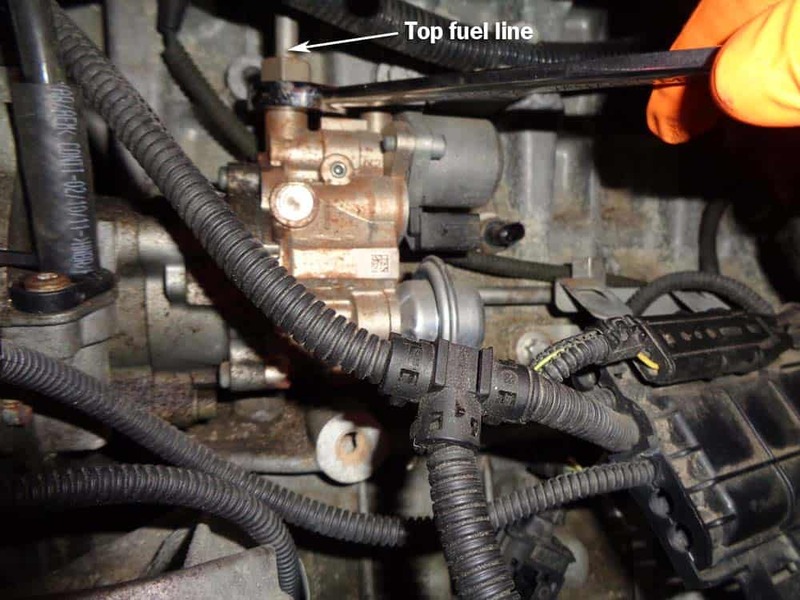 Remove fuel line from engine. 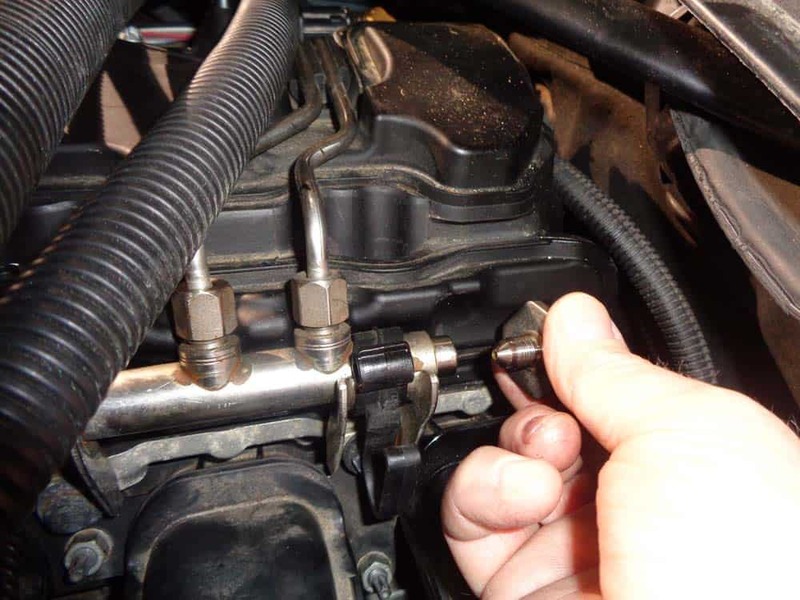 Use a 5mm long reach hex socket to remove the three bolts anchoring the fuel pump to the engine. ***You must use long reach hex sockets. 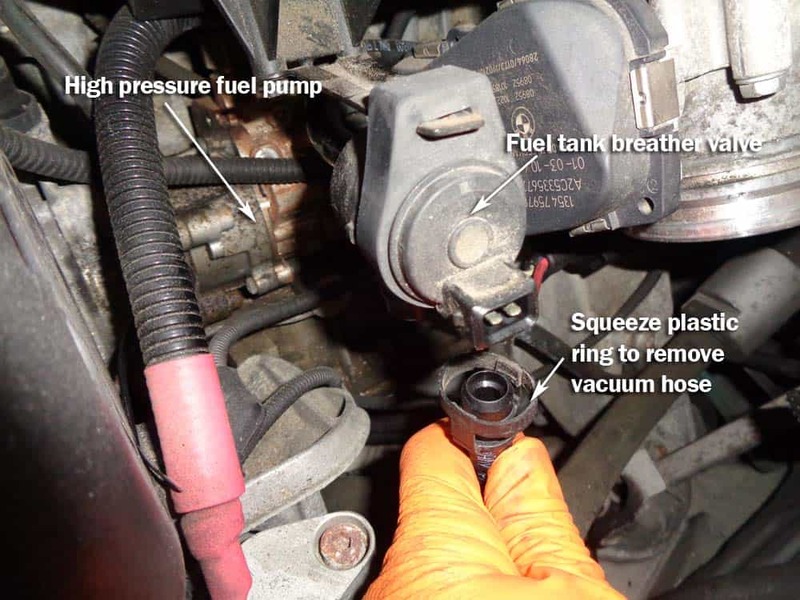 You will not be able to remove the fuel pump mounting bolts with a small hex socket or hex wrench. Remove old fuel pump from vehicle. Verify the new fuel pump comes with a new o-ring before installing. 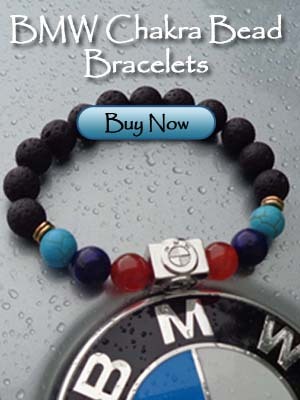 If it did not come with a new o-ring, order one by clicking here (BMW Part # 13-51-7-528-408). ***DO NOT install new pump with old o-ring. 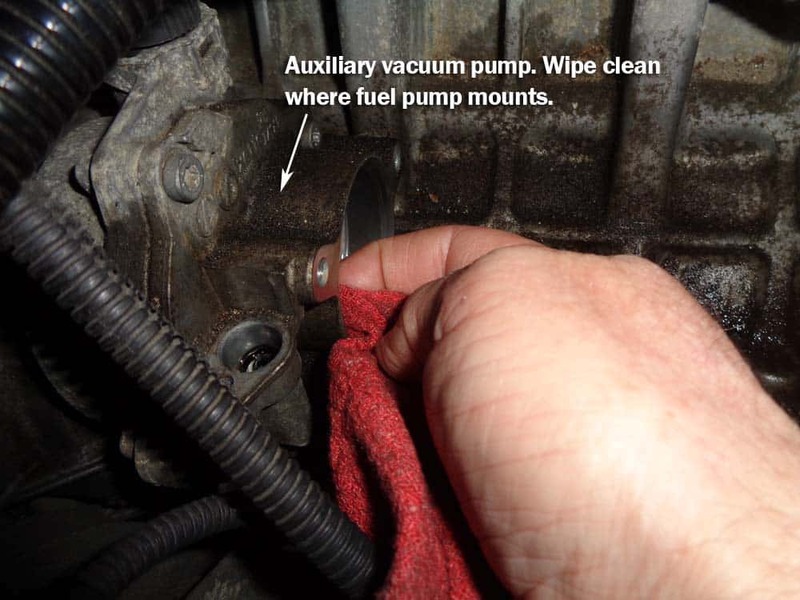 Make sure the auxiliary vacuum pump (where fuel pump mounts to) is clean so there is a tight unobstructed fit with fuel pump o-ring. Install the new BMW high pressure fuel pump. Torque fuel pump mounting bolts to 14 Nm (10 ft-lb). 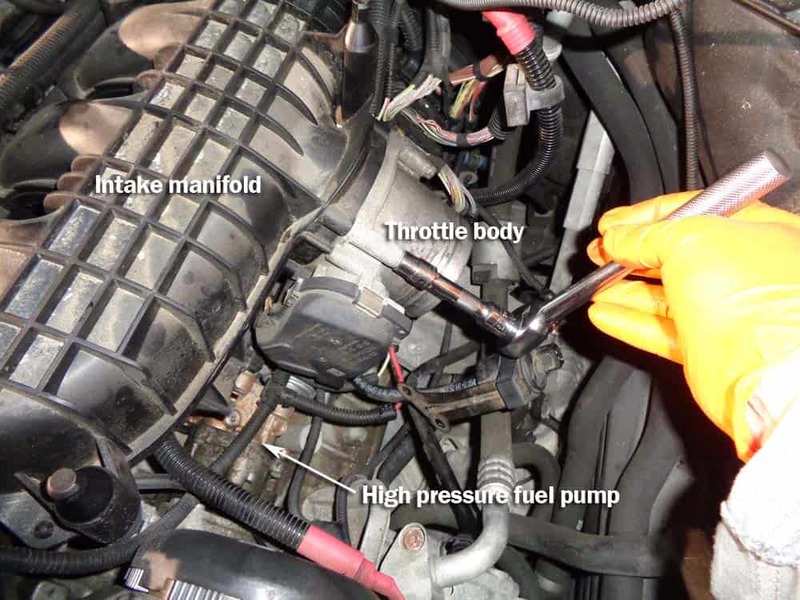 Reinstall fuel lines in the following sequence: Top fuel line – a) Hand tighten to top of pump, hand tighten to fuel rail, LOOSELY install bolt in fuel line mount (just a couple turns), b) Final tighten to top of pump, then final tighten to fuel rail, c) Final tighten fuel line mount to engine block. 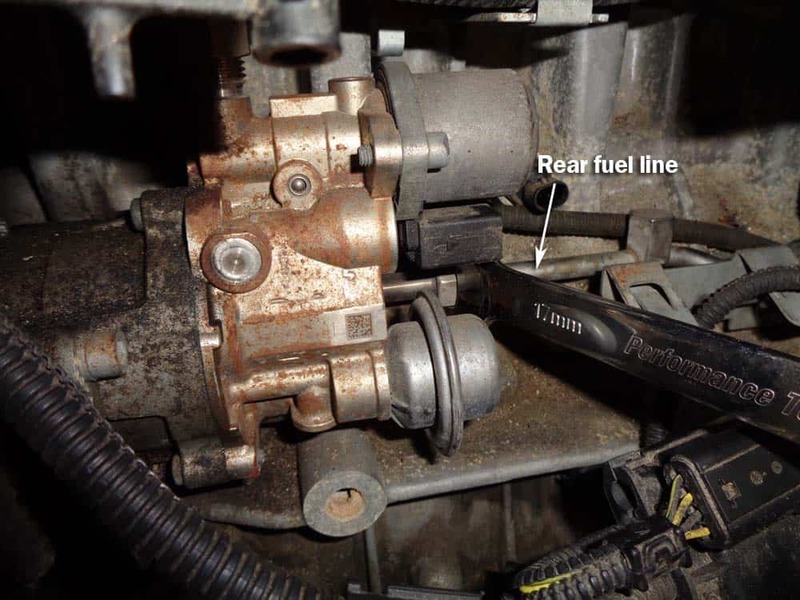 Rear fuel line – a) Final tighten to back of pump. b) Reinstall wiring harness mounting bracket and tighten bolts. 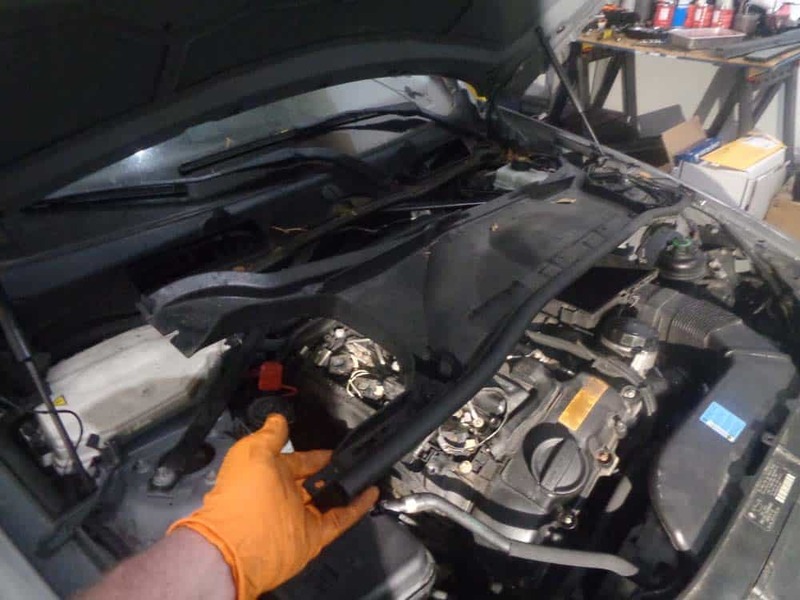 Reinstall intake manifold following above steps in reverse. 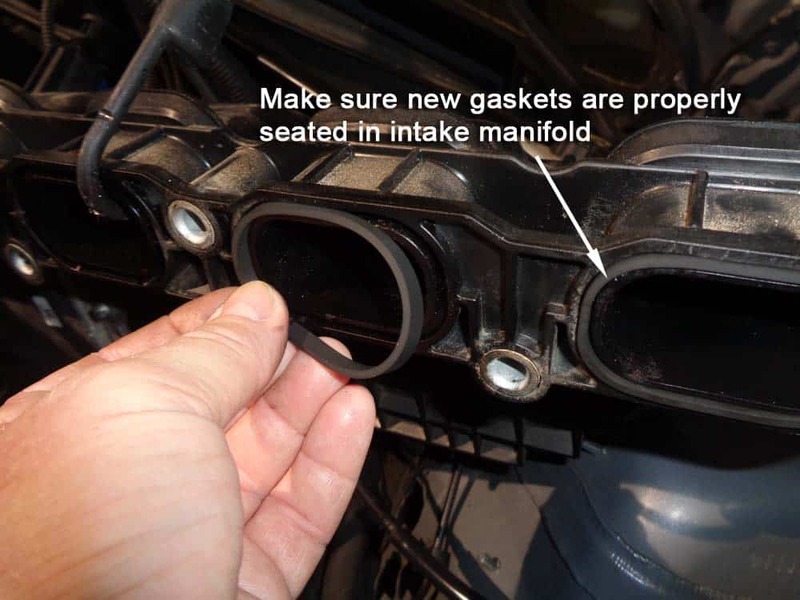 Make sure to install new intake manifold gaskets. 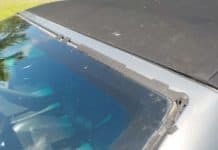 The old gaskets could leak if reused. 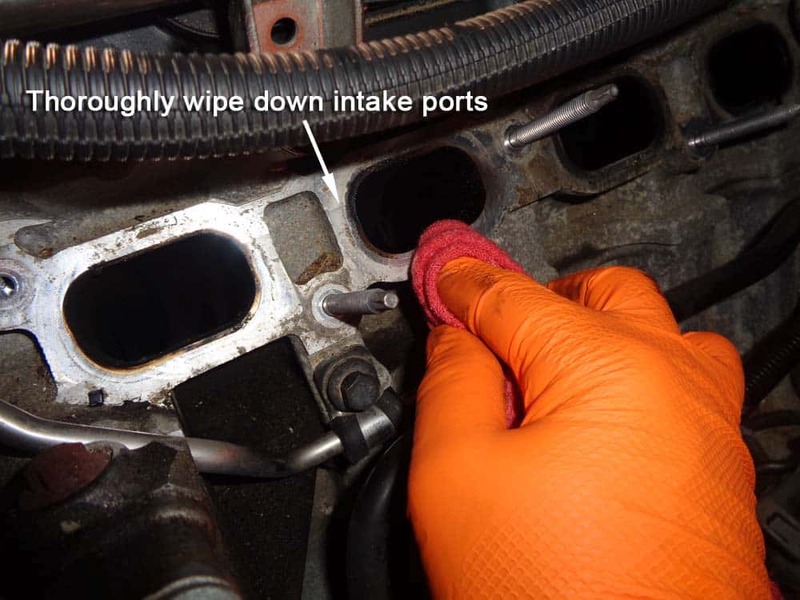 Make sure to thoroughly clean the engine head with a rag before reinstalling the intake manifold (see images below). Torque the intake manifold nuts to 15 Nm (11 ft-lb). 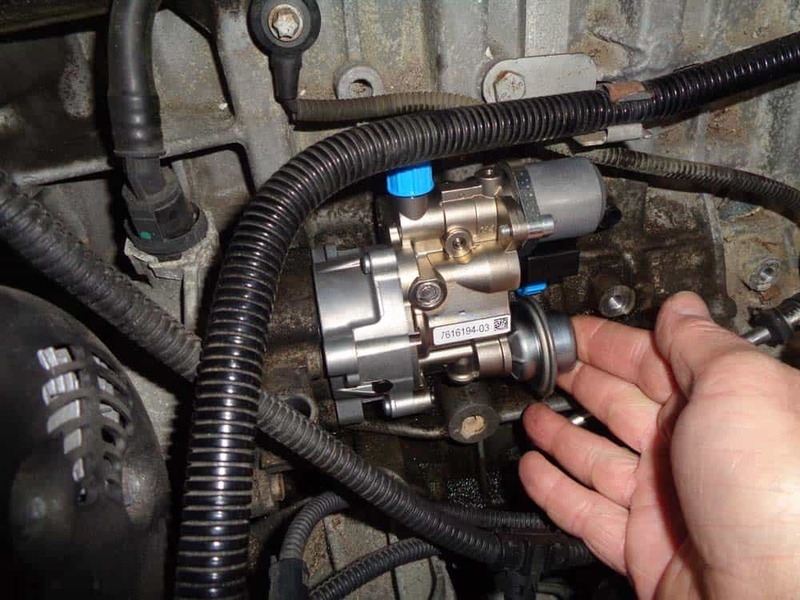 Reinstall the throttle body following above steps in reverse. 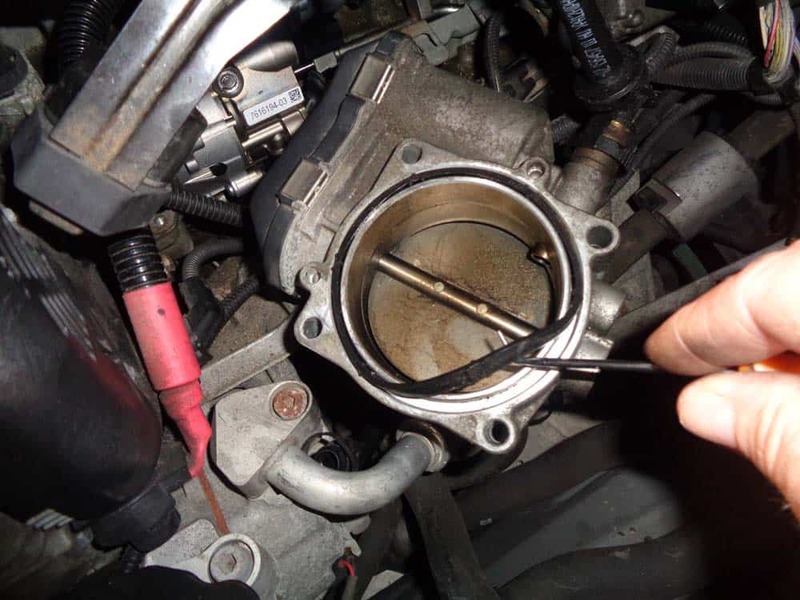 Make sure to install a new throttle body o-ring when reassembling. The old o-ring could leak if reused. 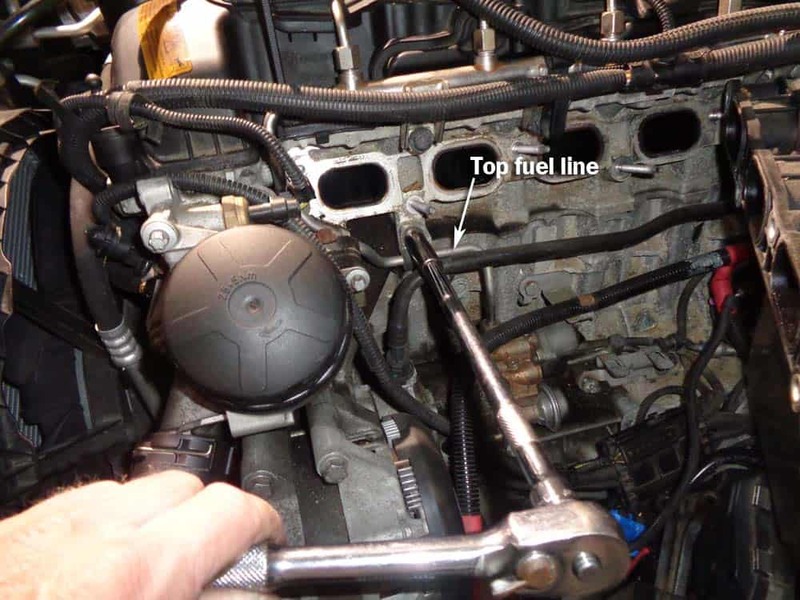 Torque throttle body mounting bolts to 8 Nm (70 in-lb) (6 ft-lb). Optional step – install new high pressure fuel rail pressure sensor. 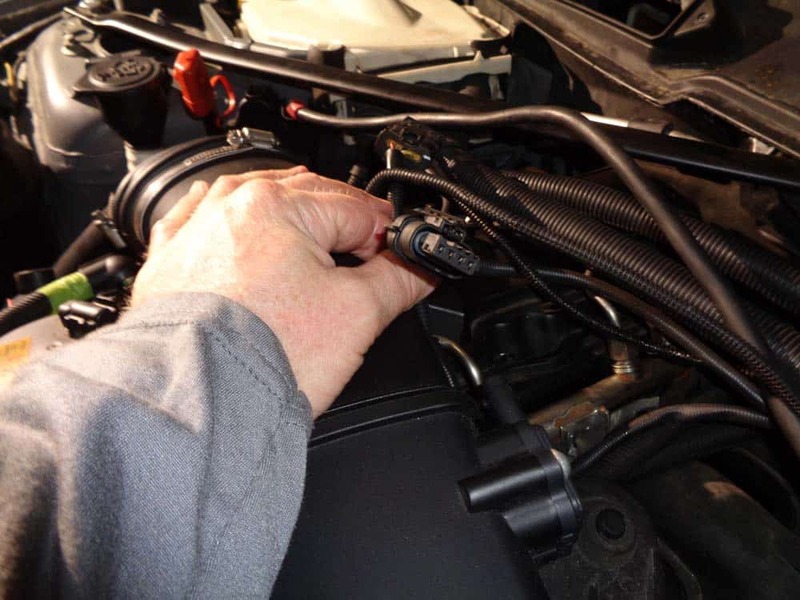 Use an adjustable wrench to remove old sensor from fuel rail. Install new sensor and tighten (do not over tighten…just make snug). Reinstall the cowl filter housing. Start car and test system. It will take the engine a few cranks to get the fuel into the cylinders so vehicle can start.